We’re just starting work on a set of three dances for the Midsummer Dream Festival on June 22nd. 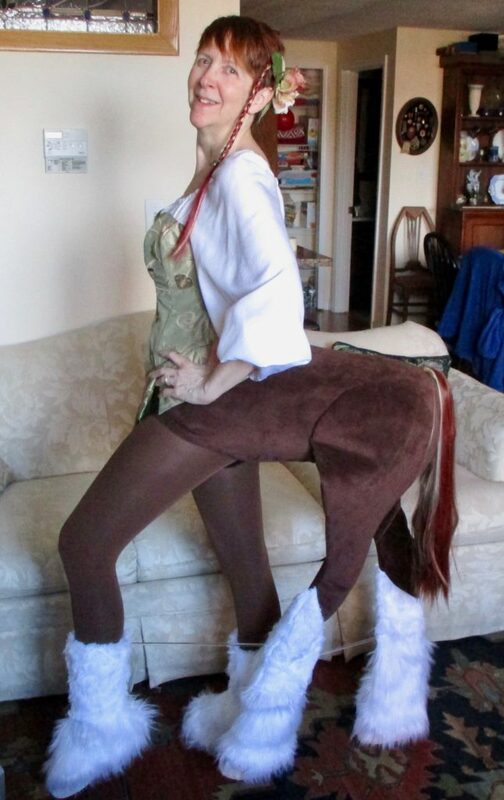 Here’s the kicker; we’re doing them with four legs (each) instead of two. The theme for this year’s festival is Magical and Mysterious creatures. I think I can safely guarantee that you’ll never get another chance to see a pair of centaurs doing vintage foxtrot and tango. Come join us for a fun day—it should be quite a sight! There’s a new video on YouTube from a recent performance of ours showing a couple of variations of nineteenth-century Waltz, a ragtime Tango (nineteen-teens) and a ragtime Fox’s Trot. It includes some spoken explanation of the dances in the beginning and some talk at the end about how we research what we do but if you’d like to go straight to the specific dances, the description with the video offers direct links. I’ve also added a link at left to a printable pdf of the Downtown Halls chapter tweaks I mentioned in an earlier post. Traditional English tune and country dance, longways for as many as will. Adapted for one couple (w/skipping omitted for hot weather). Traditional English tune and circle dance. Adapted for one couple. Traditional English tune and country dance for four dancers. Adapted for one couple and fairy wands. Danced to an excerpt from “Peri Waltzes” by Gary Freeman. Music performed by Eastman Wind Ensemble. Traditional European (German?) country dance later adapted for mid-nineteenth century ballrooms and still popular in the American folk dance community. “Abbots Bromley Horn Dance” is a traditional English tune and dance. Here it’s being used as a single line processional for as many as want to join. Music performed by Jennifer Pratt-Walter and Valerie Blessley. “Skye Boat Song” is a traditional Scottish air (it’s also the theme from “Outlander”). Here it’s being used as the tune for a simple participatory circle waltz. Music performed by Julie Murphey (tempo has been sped up). Repeat entire sequence as needed. “Dans En Dro” is a traditional tune from the Brittany region of France. It’s used here for a participatory Greek line dance, the Kalamatianos. page 101: There was, it turns out, at least one dance in the Old Market Building. When the Lowell City Guards opened their office in the building in the mid-1800s, they held a dance in the Market House hall to celebrate. page 101–102: Monsieurs Pushee and Gee, who invited the public to a dance in the new Appleton Block, were not connected with the Appleton Bank. They were dance teachers renting the hall in the building for their dancing school and were eager to show off their new space. And, while I’d still swear that the name of the band for this event looks like Pushes and Bends Cotillon Band in the old newspaper scans, it appears it was actually named after Monsieur Pushee and a musician named Alonzo Bond. Thus it would be Pushee and Bond’s Cotillon Band—but I still like the other name better! page 104: The office for Hibbard’s Orchestra was not at the apex of the junction between Gorham and Central Streets; it was in the Harrington Building, one structure closer to Merrimack Street (the street’s multiple renumberings fooled me on this one). Whatever remains of the Harrington Building has been swallowed up by the current Eastern Bank building. page 110: I shan’t go into the confusing history of Colonial Hall in detail here, but suffice it to say that the structure now known as the Pollard Building at the corner of Palmer and Middle Streets had two, or possibly three halls on its second floor around the turn of the last century. Two of the halls were Colonial and Middlesex, and the Foresters Club either had their own hall or shared Middlesex Hall and dubbed it Foresters Hall for their gatherings. These halls regularly held dances and were lost to fire in 1926. The building was rebuilt without the dance halls, and the upper floors were eventually removed at a later date. page 116: The photo of the train depot that held Huntington Hall is from a souvenir book titled “Views of Lowell and Vicinity” published in 1905. But since the building burned in 1904 it’s safe to say the photo is earlier than that. Posted on July 29, 2017 Categories UncategorizedLeave a comment on Folk Festival Weekend! We’ll be selling books and doing 3 short performances at Mill no. 5’s Otherwhere Holiday Affaire next Saturday. Loads of interesting vendors, fascinating setting. Come join us! The Affaire is from noon to six. Posted on December 4, 2016 Categories UncategorizedLeave a comment on Performance(s) Next Saturday! Reading and Book Signing in Lowell! We’re taking part in an author’s night tomorrow, November 17th from 6–8 at COOL place, 122 Merrimack Street, Lowell. 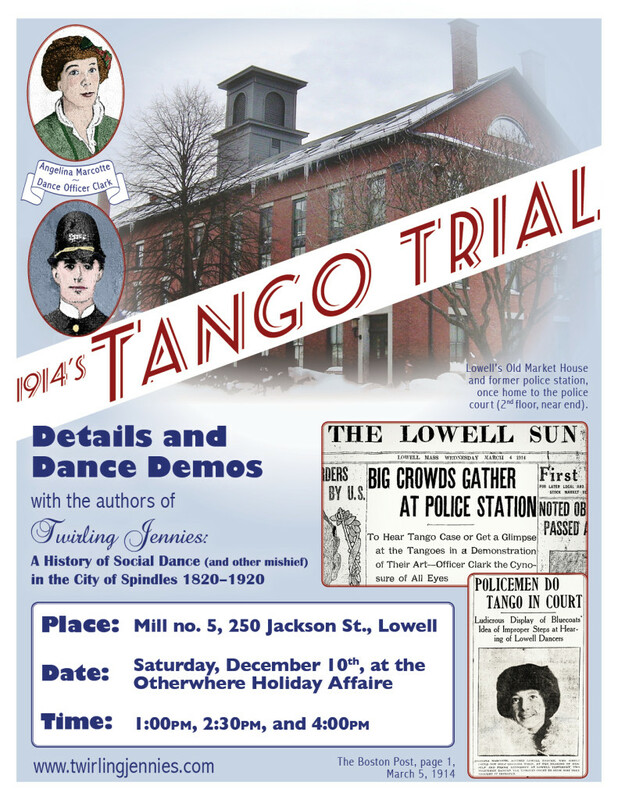 Stop by and hear me read about Lowell’s crazy 1914 Tango Trial! Posted on November 16, 2016 Categories UncategorizedLeave a comment on Reading and Book Signing in Lowell! 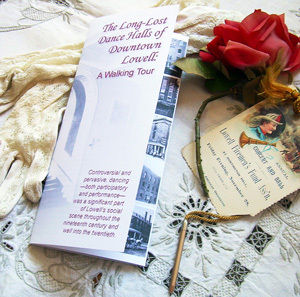 The finished walking tour brochure! We’ll be in downtown Lowell at Mill no. 5’s OtherWhere Market from noon to 6:00 on Saturday, April 30th signing (and selling) books. For those who don’t know, Mill no. 5 is an eclectic mall on the fourth floor of 250 Jackson Street—just follow the signs from the sidewalk to the elevator hidden in the back corner of the breezeway. 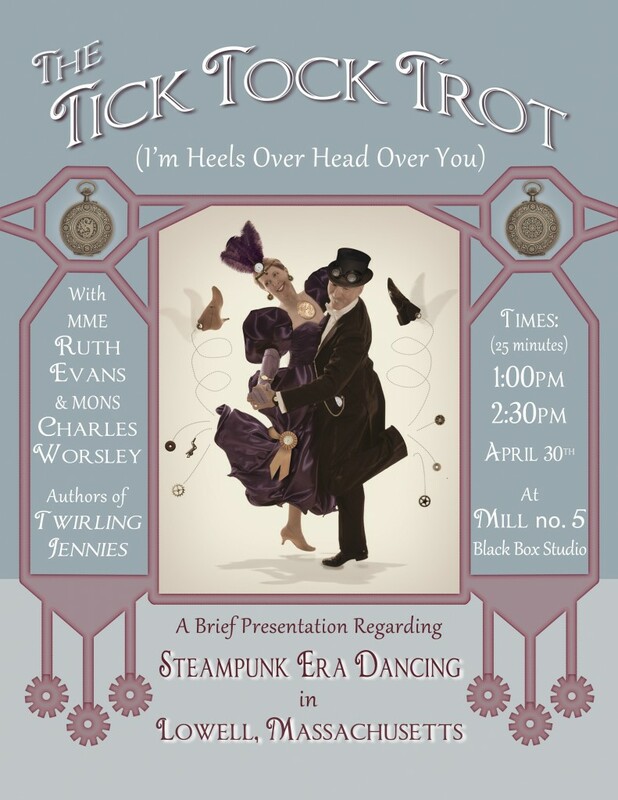 There’s a Steampunk theme for the Market this time around and we’ll be doing presentations with demos at 1:00 and 2:30 regarding Victorian and Edwardian dancing in Lowell.